1. Suitable for Epson XP55 Printer. 2. Stability of the chips, has been tested for many times before selling. 3. Install reset chip with ink cartridges,can show ink level. 1.) Since 2003,we specialized in producing Printer consumables products,over 10 years experience. 2.) 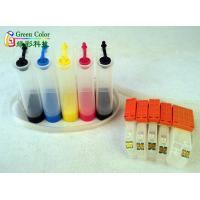 Full of products:Ink,CISS,Toner cartridge,Refillable cartridge,DTG Printer ect. 3.) We will often develop new products to meet market trend and customer demand. 4.) Stable quality,professional technical team;100% quality guarantee;100% replacement for faulty goods.